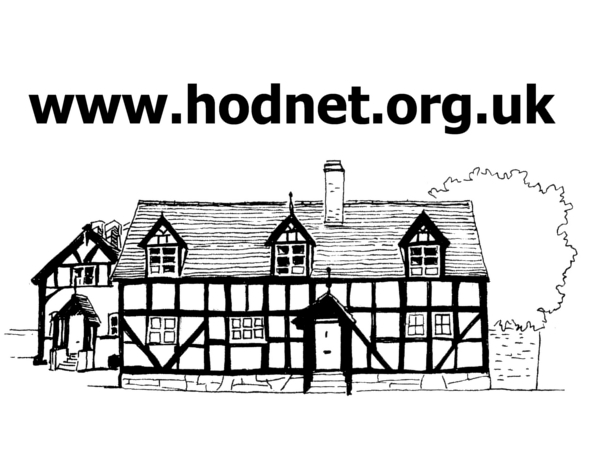 Calls for a bypass for Hodnet began in the 1940’s. Proposals for the bypass eventually began in earnest in 1990. 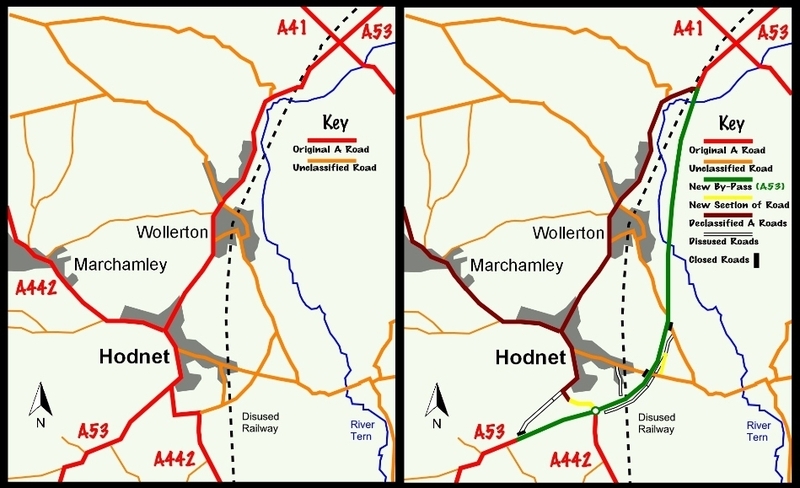 4 Routes were proposed, 2 of which also bypassed Wollerton and Lostford as well as Hodnet. Public Exhibitions were held where maps for the proposed routes were staged and residents could vote for their preferred route. The Blue route was the preferred route as it bypassed Hodnet, Wollerton and Lostford. The cost was estimated at £10,000,000. Many environmental impact surveys were carried out and mitigation measures to alleviate or reduce any impact were reported on. This was a massive task. Vociferous protests began immediately. So two groups were set up, the Tern Valley Protection Association who were against the route and the Bypass Wollerton Action Group who were fighting for the bypass and the route. A Public Enquiry had to be held and this took place at the Lyon Hall, Hodnet in 1993. The Inspector ruled in favour of the bypass. But costs kept rising because of the time delay caused by the opposition as extra surveys, etc. had to be completed. Badgers and wild life featured large on the issue. Permission for the bypass on the Blue route was given in July 1993 for a possible 1994 start. Delays over funding occurred and in 1996 the Private Funding Initiative was suggested. On 12 December 1996 Hodnet Parish Councillors went to London to meet with our MP Mr John Biffen who took them to meet the Minister for Roads, etc., Mr John Watts, to plead the case for funding for the bypass. In the meantime many accidents and injuries (including some deaths) continued to happen, particularly through Wollerton and Lostford. In December 1999 the green light for funding was given with a start date for February 2002. Preliminary work for the £14,000,000 bypass began in February 2002. The first turf was cut on Thursday, 25 April 2002 by Hodnet Parish Councillor, North Shropshire District Council and Shropshire County Councillor Mr Edward Dodd. He had fought and worked hard for many years to get this bypass built. Many people were there including some pupils from Hodnet County Primary School. On 11 June 2003 an Exhibition was held in the Lyon Hall to show the progress that was being made on the construction. Staff from Shropshire County Council and the McAlpines construction team were on hand to answer any questions. 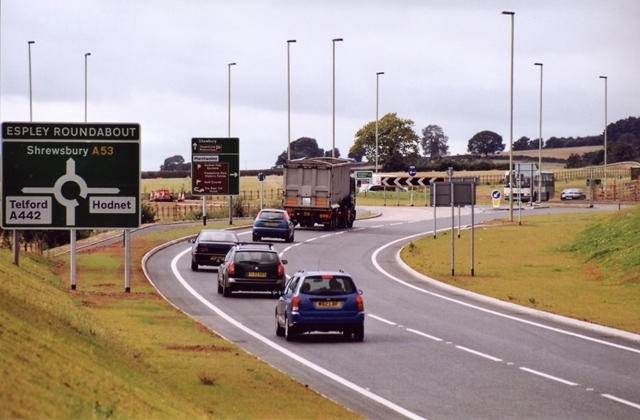 In August 2003 the A53 road between Tern Hill roundabout and the Lostford junction had to be closed for the “tie-in” section of the new road to be constructed. The week before the Official Opening a Bypass Bonanza was held on Sunday, 7 September 2003 when a street party and charity fundraiser took place on the new bypass, including a sponsored walk covering most of the bypass in both directions. A very good day. 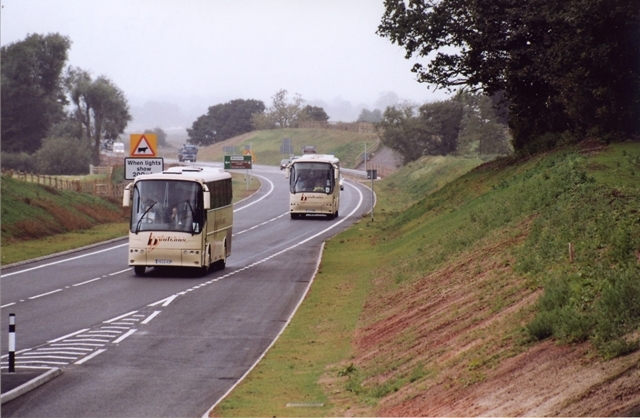 The Official Opening ceremony took place on Wednesday, 10 September 2003 when the bypass was opened and the ribbon cut by Councillor Major Adrian Coles of Shropshire County Council. This took place on the bridge over the River Tern at Wollerton. None of the perceived dangers of the new road have materialised and it would be fair to say that the great majority of people are delighted with the bypass. For those who are not aware of the changes to the area, including to several minor roads, caused by the construction of the bypass, the two maps below show how things looked like before and after it was built. If you have any memories of the construction of the bypass which you would like to share with others, please use this form to let us know about them. Photographs will be especially appreciated. A brief report on and list of environmental features created during the construction overseen by Moore Environment is available on their website.